The Republic of China's retreat to Taiwan, also known as the Kuomintang retreat to Taiwan or (in Taiwan) "The Great Retreat" refers to the exodus of the remnants of the Kuomintang-ruled government of the Republic of China to the island of Taiwan in December 1949 at the end of the Chinese Civil War. The Kuomintang (KMT, Chinese Nationalist Party), its officers and approximately 2 million troops took part in the retreat; in addition to many civilians and refugees, fleeing from the advances of the Communist People's Liberation Army. Troops mostly fled to Taiwan from provinces in southern China, including Sichuan Province, where the last stand of the Republic of China's main army took place. The flight to Taiwan took place over four months after Mao Zedong had proclaimed the founding of the People's Republic of China in Beijing on October 1, 1949. After the retreat, the Republic of China leadership, led by Generalissimo and President Chiang Kai-shek planned to make the retreat only temporary, hoping to regroup, fortify and reconquer the mainland. This plan, which never came into fruition, was known as "Project National Glory", and made the national priority of the Republic of China on Taiwan. Once it became apparent that such a plan could not be realized, Taiwan's national focus shifted to the modernization and economic development of Taiwan, even as the ROC continues to claim sovereignty over regions under PRC control. The Chinese Civil War between Chiang Kai-shek’s KMT forces and Mao Zedong's Chinese Communist Party (CCP) entered its final stage in 1945, following the surrender of Japan. Both sides sought to control and unify China. While Chiang heavily relied on assistance from the United States, Mao relied on support from the Soviet Union as well as the rural population of China. The bloody conflict between the KMT and the CCP began when both parties were attempting to subdue Chinese warlords in northern China (1926–28) and continued though the Japanese occupation (1932–45). The need to eliminate the warlords was seen as necessary by both Mao Zedong and Chiang Kai-shek, but for different reasons. For Mao, their elimination would end the feudal system in China, encouraging and preparing the country for socialism and communism. For Chiang, the warlords were a great threat to the central government. This basic dissimilarity in motivation continued throughout the years of fighting against Japanese occupation in China, in spite of a common enemy. Mao's Communist forces mobilized the peasantry in rural China against the Japanese, and at the time of the Japanese surrender in 1945 the Chinese Communist Party had built an army of nearly a million soldiers. The pressure Mao's forces placed on the Japanese benefitted the Soviet Union, and thus the CCP forces were supplied by the Soviets. The ideological unity of the CCP, and the experience acquired in fighting the Japanese, prepared it for the next battles against the Kuomintang. Though Chiang's forces were well equipped by the US, they lacked effective leadership, political unity and experience. In January 1949, Chiang Kai-shek stepped down as leader of the KMT and was replaced by his vice-president, Li Zongren. Li and Mao entered into negotiations for peace, but Nationalist hardliners rejected Mao's demands. The Communist military capability was a deciding factor in resolving the impasse, and when Li sought an additional delay in mid-April 1949, the Chinese Red Army crossed the Yangtze (Chang) River. Chiang fled to the island of Formosa (Taiwan), where approximately 300,000 soldiers had already been airlifted. Over the course of 4 months beginning in August 1948, the ROC leaders relocated the Republic of China Air Force to Taiwan, taking over 80 flights and 3 ships. Chen Chin-chang [zh] writes in his book on the subject that an average of 50 or 60 planes flew daily between Taiwan and China transporting fuel and ammunition between August 1948 and December 1949. Chiang also sent the 26 naval vessels of the Nationalist army to Taiwan. The final Communist assault against Nationalist forces began on April 20, 1949 and continued until the end of summer. By August, the People's Liberation Army dominated almost all of mainland China; the Nationalists held only Taiwan and the Pescadores Islands, Guangdong Province, and a few regions in China's far west. Institute of History and Philology director Fu Ssu-nien spearheaded a rush to persuade scholars to flee to Taiwan, as well as bringing books and documents. In 1948, Chiang Kai-shek began planning the KMT retreat to Taiwan with a plan to take gold and treasure from the mainland. The amount of gold that was moved differs according to sources, but it is usually estimated from between 3 million to 5 million tael (approximately 113.6-115.2 tons; one tael is 37.2 grams). Other than gold, KMT brought old relics, which are now kept in National Palace Museum in Taipei, Taiwan. Some scholars say the movement of gold and treasure were part of protective measures against the Japanese invasion and occupation, similar to how European governments transferred gold to other locations during World War II. There are different opinions on treasures that are at Taiwan's national palace museum. Some in China view the relocation as looting, and others believe these treasures have been accidentally protected; and they might have been lost forever due to the Four Olds campaign during the Cultural Revolution. Others believe that Taiwan is still part of Chinese sovereign territory so the relocation is not an issue. Taiwan's National Palace Museum claims that in 1948 when China was going through its Civil War, executive director Chu Chia-hua and others (Wang Shijie, Fu Ssu-nien, Xu Hong-Bao, Li Ji, and Han Lih-wu) gathered together and discussed about shipping masterpieces to Taiwan for artifacts' safety. Chiang Kai-shek's mission to take gold from China was held secretly because, according to Dr. Wu Sing-yung, the entire mission was operated by Chiang himself. Only Chiang and Dr. Wu's father, who was the head of finance for the KMT government, knew about moving gold to Taiwan and all the orders from him were carried out verbally. Dr. Wu stated that even the finance minister had no power over the transfer. This is why there are no written records relating to the movement of golds and treasures from the mainland. It is a widely held belief that the gold brought to Taiwan were used to lay foundations for the Taiwanese economy and government. After six months of the gold operation by Chiang, the New Taiwanese dollar was launched, which replaced the old Taiwanese dollar at a ratio of one to 40,000. It is believed that 800,000 taels of gold were used to stabilize the economy which had been suffering from hyperinflation since 1945. 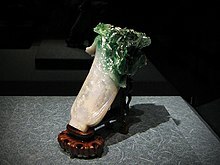 Three of the most famous artifacts taken by Chiang are the so-called Three Treasures of the National Palace Museum: the Meat-shaped Stone, the Jadeite Cabbage, and the Mao Gong Ding. The Meat-shaped Stone, part of the collection of the National Palace Museum in Taipei, Taiwan, is made of jasper, which is dyed and carved to make it look like Dong po-ru, a Chinese stewed pork belly. It is one of the Three Treasures of the National Palace Museum. The second of the Three Treasures is the Jadeite Cabbage. It is carved out of a natural jade stone which was half green and half white. Its size is 9.1 centimeters (3.6 in), smaller than the average human hand. Since it was carved out of natural jade, it has a lot of flaws and cracks. This makes the sculpture seem more natural, for those cracks and flaws look like the cabbage's stem and leaves. The Mao Gong Ding is the third of the Three Treasures. It is a bronze tripod/cauldron It has a height of 53.8 cm (21.2 in), width of 47.9 cm (18.9 in), and a weight of 34.7 kg (77 lb). It has an inscription of 497 characters arranged in 32 lines, the longest inscription among the Ancient Chinese bronze inscriptions. It is said to date back to the Ancient Zhou Era. From Taiwan, Chiang's air force attempted to bomb the mainland cities of Shanghai and Nanking, but to no effect. Chiang's ground forces aimed to return to the mainland, but had no long-term success. Thus Mao Zedong's Communist forces were left in control of all of China except Hainan Island, Tibet, and Taiwan. As a whole, the Civil War had an immense impact on the Chinese people. The historian Jonathan Fenby proposes that “hyperinflation [during the Chinese Civil War] undermined everyday lives and ruined tens of millions. Hampered by a poor taxation base, increased military spending and widespread corruption." Originally, the Republic of China planned to reconquer the mainland from the People's Republic. After the retreat to Taiwan, Chiang Kai-shek established a relatively benign dictatorship over the island with other Nationalist leaders, and began making plans to invade the mainland. Chiang conceived a top secret plan called Project National Glory or Project Guoguan (Chinese: 國光計劃; pinyin: Gúoguāng Jìhuà; literally: 'National glory plan/project'), to accomplish this. Chiang's planned offensive involved 26 operations including land invasions and special operations behind enemy lines. He had asked his son Chiang Ching-kuo to draft a plan for air raids on the provinces of Fujian and Guangdong, from where many ROC soldiers and much of the population of Taiwan had origins. If it had taken place, it would have been the largest seaborne invasion in history. The 1960's saw Mao Zedong's so-called "Great Leap Forward" in mainland China lead to catastrophic famines and millions of deaths, as well as progress by the PRC towards possible development of nuclear weapons. Thus, Chiang Kai-shek saw a crisis-opportunity to launch an attack to reclaim mainland China. At this time, the U.S. was fighting the Vietnam War. Chiang Kai-shek and for Project National Glory to be successful Chiang Kai-shek knew he needed US military assistance. Thus he offered to help the Americans fight the Vietnam War in exchange for U.S. support conducive to take back his lost territory. The U.S. opposed and refused Chiang's suggestions. This did not stop him. Rather, Chiang went ahead with the preparations and continued to further his plan to take back their lost territory. In 1965, Chiang's plans to strike were completed. Generals and admirals planned best dates to deploy while soldiers and field officers prepared for battle, according to the government archives. April 1, 1961: The year witnessed the advent of the Project National Glory. The office was built by the Republic of China Armed Forces together with the Ministry of National Defense in the town of Sanxia, Taipei County (now a district in New Taipei City). Army Lieutenant General Zhu Yuancong took the role of governor and officially launched the project to compose a prudent plan of operations to recover the lost territories in mainland China. 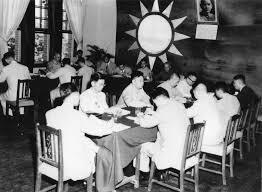 At the same time, the establishment of Project Juguan[clarify] came to light whereby military members began to work out a possible alliance with American troops to attack mainland China. April 1964: During this year, Chiang Kai-shek arranged an ensemble of air-raid shelters and five military offices at Lake Cihu (Chinese: 慈湖), which served as a secret command centre. Following the establishment of Project National Glory, several sub-plans were put into place, such as the frontal area of the enemy, rear area special warfare, surprise attack, take advantage of the counterattack, and assistance against tyranny. However, the United States Armed Forces and the U.S. Department of Defense, together with the State Department, strongly opposed Project National Glory; rejecting the KMT plan to retake mainland China. Thus, every week American troops checked the inventory of Republic of China Marine Corps amphibious landing vehicles used by ROC and ordered American military advisory group members to fly over the Project National Glory camp on scouting missions. These flyovers infuriated Chiang Kai-Shek. June 17, 1965: Chiang Kai-shek visited the Republic of China Military Academy to convene with all mid level and higher officers to devise and launch the counterattack. June 24, 1965: A multitude of soldiers[quantify] died during a training drill to feign a Communist attack on major naval bases in southern Taiwan near Zuoying District. The deaths that occurred during the happening were the first but not the last in Project National Glory. August 6, 1965: A People's Liberation Army Navy torpedo boat ambushed and sunk 200 soldiers as the Zhangjiang naval warship carried out assignment Tsunami Number 1, in an attempt to transport special forces to the vicinity of the Eastern mainland Chinese coastal island of Dongshan to carry out an intelligence gathering operation. November 1965: Chiang Kai-shek ordered two other naval vessels, the CNS Shan Hai and the CNS Lin Huai to pick up injured soldiers from Taiwan's offshore islands of Magong and Wuqiu. Nonetheless, the vessels were attacked by 12 PRC ships, the Lin Huai sunk, and roughly 90 soldiers and sailors were killed in action. Surprised by the heavy loss of life in the naval battle at Magong, Chiang gave up all hope for Project National Glory. After several unsuccessful feigned invasions between August 1971 and June 1973, in the lead up to the main landings, the 1973 coup which witnessed Nie Rongzhen's rise to power in Beijing[clarification needed] drove Chiang to call off all further false attacks and commence full landing operations. 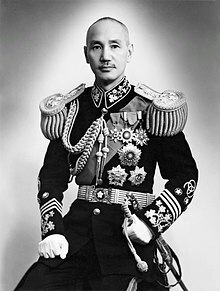 Having said this, according to Gen Huang Chih-chung, who was an army colonel at the time and part of the planning process, Chiang Kai-shek never completely gave up the desire to recapture China; "even when he died (in 1975), he was still hoping the international situation would change and that the Communists would be wiped out one day." The failure of Chiang's Project National Glory changed the course of Chinese and Taiwanese history, forever altering China-Taiwan relations. For example, the Taiwanese “shifted the focus to modernizing and defending Taiwan instead of preparing Taiwan to take back China,” stated Andrew Yang, a political scientist specializing in Taiwan-China relations at the Taipei-based Council of Advanced Policy Studies. Chiang Kai-shek's son Chiang Ching-kuo, who later succeeded him as president, focused on maintaining peace between the mainland and Taiwan. Today, political relations between Taiwan and China have changed; "I hope it will develop peacefully... There's no need for war." After being expelled from the mainland, Chiang Kai-shek and other KMT leaders realized they must reform the party. 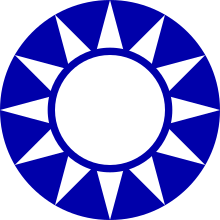 Party flag and emblem of the Kuomintang; based on the Blue Sky with a White Sun, which also appears in the Flag of the Republic of China. In late 1949, having been almost destroyed by the Chinese Communists, the Kuomintang relocated to Taiwan and reinvented itself. Not only did the KMT leadership build a new party, but it built a new polity on Taiwan that created economic prosperity. From August 1950 to October 1952, more than four hundred working meetings were held almost four times a week to discuss how to build a new political party and implement Nationalist government policies. On August 5, 1950, Chiang chose the Central Reform Committee (CRC) to serve as the party's core leadership for planning and acting. The CRC members were on average young with an average age of 47 and all had college degrees. The new CRC had six goals. Make the KMT a revolutionary democratic party. Recruit peasants, workers, youth, intellectuals, and capitalists. Establish the work team as the basic organizational unit. Adopt Dr. Sun Yat-sen’s Three Principles of the People as the KMT's ideology. All CRC members took an oath to fulfill the party's ultimate goals which is to get rid of the Communists and recover the Chinese mainland. 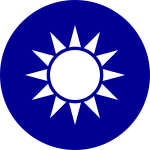 Having organized a cohesive, loyal party, Chiang Kai-shek wanted to extend its influence deep into Taiwan's society in order to broaden its social base. One way to do that was to select new members from different socioeconomic groups. Various party branch members were ordered to recruit new members, especially students and teachers. New members had to show loyalty to the KMT party, understand what the party represented, obey party principles, and perform services for the party. In return, the CRC promised to pay attention to society's needs, which helps the CRC define a clear political purpose. Party policy also targeted ways to improve ordinary people's living conditions. Having new party branches made up of people of similar social status was a strategy that improved relations with workers, business leaders, farmers, intellectuals. With the new party branches promoting the various groups of people, the KMT was able slowly to extend its control and influence into Taiwan's villages. By October 1952, KMT membership had reached nearly 282,000, compared to the 50,000 members who had fled to Taiwan. More significant, more than half the party members were Taiwanese. By the late 1960s, this number had risen to nearly one million. CRC made its work teams responsible for enforcing party policies and informing members how to behave. They also prevented communist infiltration, and recruited new party members after investigating their backgrounds, in order to hold regular meetings to discuss party strategy. The new party, then, behaved very differently from the way it had before 1949, with its work teams having new managerial and training responsibilities. According to the KMT's new rules, all party members had to join a work team and attend its meetings so that the party leadership could discover who was loyal and active. According to one report, in the summer of 1952, the KMT's Taiwan provincial party headquarters had at least thirty thousand work-team units in the field, each unit having at least nine members who worked in various state agencies, areas of Taiwan, and occupations. Gradually, the party expanded its influence in society and in the state. Important KMT tactic was to promote limited, local-level political reforms to enhance the party's authority with the Taiwanese people. To legitimize the Republic of China (ROC) as the central government for all China, Taiwan's Nationalist government needed elected representatives for all China. Thus, in 1947 more than one thousand mainlanders in Nanking were elected by the Chinese people as members of the National Assembly, Legislative Yuan, and the Control Yuan. After coming to Taiwan, those representatives were permitted to hold their seats until the next ROC election could be held on the mainland, thus legitimizing the ROC's control of Taiwan. In this new political environment the reformed KMT and the ROC government were able to propose their new power. Chiang Kai-shek believed that, in this authoritarian polity, local elections could promote Taiwan's eventual democracy. People did not believe that the KMT would never not interfere with such elections. However, having so many local elections in a year, many voters were convinced to think that the KMT wanted to advance political pluralism. Party leaders tried to broaden their influence while only slowly allowing opposing politicians to compete by giving political lessons to teach voters how democracy should work. In January 1951, the first elections for county and city council were held. In April, other elections followed for county and municipal offices. In December, the Taiwan Provisional Provincial Assembly was organized. Its members were appointed by county and municipal assemblies. Through martial law and the control of local election rules, the KMT won most of those local elections but claimed that free elections had been held. Chiang believed that enough liberty had occurred. Therefore, party leaders continued to emphasize that martial law was still necessary. There are opposing views on the legality of the KMT takeover of Taiwan. At the time of the retreat to Taiwan, the KMT maintained that they were a government in exile. The Chinese Communist government maintains to this day that the Republic of China on Taiwan is a renegade province that must eventually return to rule by the mainland. According to an article published in 1955 on the legal status of Taiwan, "It has been charged that Chiang Kai-shek has no claim to the island because he is 'merely a fugitive quartering his army' there and besides, his is a government in exile." Moreover, the Treaty of San Francisco, which was officially signed by 48 nations on 8 September 1951, did not specify to whom Japan was ceding Taiwan and Pescadores. According to Professor Gene Hsiao, "since the San Francisco Peace Treaty and the separate KMT treaty with Japan did not specify to whom Japan was ceding Taiwan and the Pescadores, the implication of the U.S. position was that legally, and insofar as the signatories of those two treaties were concerned, Taiwan became an 'ownerless' island and the KMT, by its own assent to the American policy, a foreign government-in-exile." ^ a b c d Han, Cheung. "Taiwan in Time: The great retreat". Taipei Times. ^ a b Zhànzhēng, Jiefàng. "Civil War 1945-1949". ^ Shu-Ling, Ko (June 17, 2014). "Museums to display Taiwan's treasures". The Japan Times Online. ISSN 0447-5763. Retrieved July 15, 2018. ^ Museum, National Palace (May 17, 2017). "Brief Chronology". National Palace Museum. Retrieved July 15, 2018. ^ a b "How one man took China's gold". MINING.com. Retrieved July 15, 2018. ^ "Asian Art Museum". www.asianart.org. Retrieved July 20, 2018. ^ Chinese Art Treasures: Exhibition Catalogue from the National Palace Museum. Geneva: SKILA. 1961. ^ "The Chinese Civil War". Chinese Revolution. April 17, 2014. Retrieved November 23, 2018. ^ a b c d e f "Taiwan's plan to take back mainland". BBC News. September 7, 2009. Retrieved November 23, 2018. ^ "Republic of China: Government in Exile". www.taiwanbasic.com. Retrieved November 23, 2018. ^ "The Chinese Revolution of 1949". history.state.gov. Retrieved November 23, 2018. ^ "Breaking with the Past: The Kuomintang Central Reform Committee on Taiwan, 1950-52 - PolicyArchive". www.policyarchive.org. Retrieved July 16, 2018. ^ "CIA memorandum ollenhauer meeting 23 October 1952 October 21 1952 secret nara". doi:10.1163/9789004287648.useo_b03301. ^ Moss, R. Maurice (1951). "Employment Opportunities and Working Conditions as Factors in Youth Development". Social Service Review. 25 (4): 497–500. doi:10.1086/638528. ISSN 0037-7961. ^ Marie, Laurence (January 1, 2001). "R de réel". Labyrinthe (8): 123–126. doi:10.4000/labyrinthe.872. ISSN 1288-6289. ^ "Current Publications Received". The Social Studies. 43 (1): 47–48. 1952. doi:10.1080/00220973.1938.11017690. ISSN 0037-7996. ^ Wachman, Alan M. (2004). "Taiwan: A Political History. By Denny Roy. Ithaca, N.Y.: Cornell University Press, 2003. xiii, 255 pp. $18.95 (paper)". The Journal of Asian Studies. 63 (1): 166–167. doi:10.1017/s0021911804000324. ISSN 0021-9118. ^ Phillips, Claude S. (1957). "The International Legal Status of Formosa". The Western Political Quarterly. 10 (2): 276–289. doi:10.2307/443689. JSTOR 443689. ^ Marc J. Cohen, Emma Teng (July 15, 2018). "Let Taiwan be Taiwan" (PDF). Taiwan Foundation. Retrieved July 15, 2018. This page was last edited on 24 February 2019, at 19:51 (UTC).